This contemporary boutique hotel of San Nicolas was completed in 2010 to an extremely high standard. Situated in a most enviable position overlooking the fabulous Mikros Gialos Bay, with amazing panoramic vistas of the verdant rural mountains, balanced perfectly with the endless blues of the Ionian sea out to the Islands of Kefalonia, Arkoudi and Ithaka. Mikros Gialos itself is a typical old Greek village in the southern part of the island. Striking traditional houses are characteristic here, connected by a myriad of narrow alleyways and paths leading to the local shops and tavernas serving appetizing local Greek cuisine. This part of Lefkada is described time and again as the “gem” of the island. It is without doubt that you will be in complete agreement after your stay in this idyllic place. From the moment you step into this stylish hotel you find yourself in a modern environment, dominated by clean lines and muted colours in contrast to the traditional history of the area. This has been achieved successfully without losing any of the regions charm and personality. 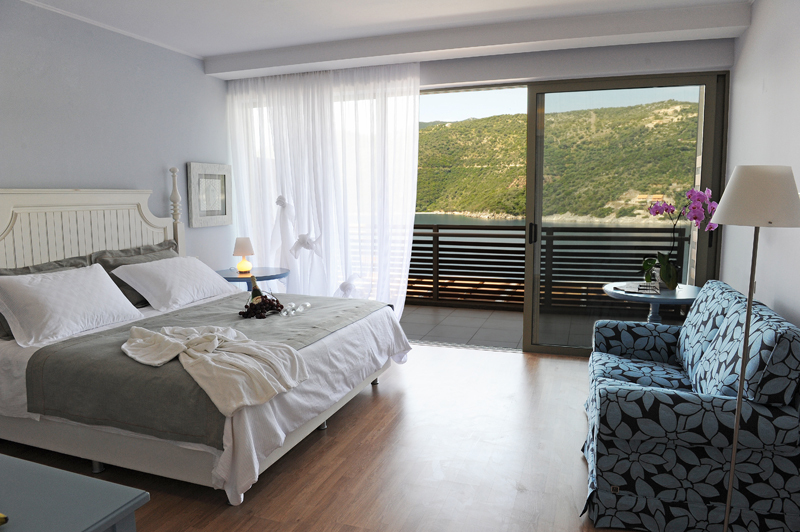 Each of the 17 rooms is different from the next, styled individually yet all benefit from the same high standards of finish as well as the fabulous panoramic sea views over the Bay of Mikros Gialos. This small hotel provides some fantastic features for their guests. The Mare e Monti restaurant offers choice of menu serving delicious foods from all parts of the Mediterranean. If you are after a snack, the beautiful swimming pool also with a breathtaking sea view, has a bar/coffee shop perfect for a quick lunch. The private beach also has its own bar exclusively for use by guests of the hotel. It is a short stroll along the bay into the village of Mikros Gialos for some gentle shopping or a meal in one of the traditional tavernas. All in all, the sumptuous and easy going ambience you find here at San Nicolas will ensure that you will want to return again and again.